Office workers in the UK are spending increasing amounts of time preparing for, and attending meetings – around 25% of their working week – according to new research from eShare. The survey of 1,005 office workers revealed that the average worker attends 3.7 meetings every week, spending one hour nine minutes preparing for each meeting and one hour 22 minutes actually attending it. 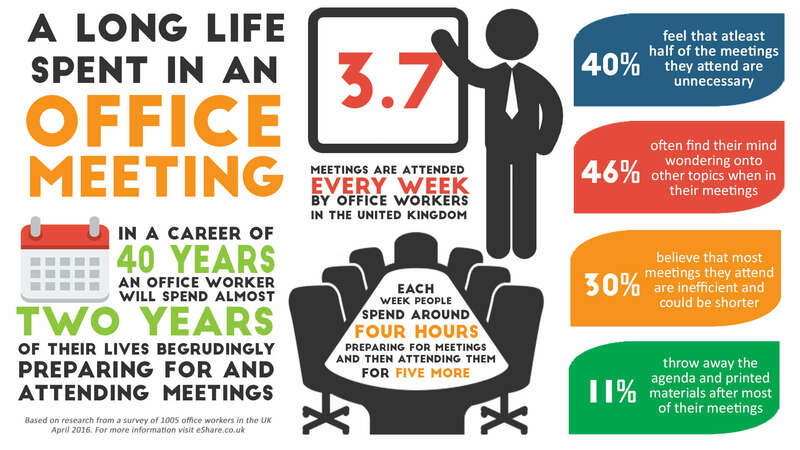 In any given working week, this means that office workers are spending more than a day preparing for, and attending meetings. Across a 40 year career, this equates to a total of 17,470 hours – two entire years of someone’s life or around 10 years of work time. eShare recently launched MeetingSquared, a new app for anyone who organises or attends meetings, and looks to bring an end to the inefficient preparation, scheduling and management of meetings. The research found that 40% of office workers feel that at least half of the meetings they attend are unnecessary, while 30% believe that most meetings they attend are inefficient and could be much shorter. The research revealed that many office workers (one in five) still attend meetings with agendas and supporting materials printed out on paper, but also that there is a worrying lack of diligence when the meeting is finished. 11% of research respondents admitted that after most meetings they just throw away the agenda and printed materials, which has a number of security implications. Almost half of respondents (45.7%) said they often find their mind wondering onto other topics when in meetings, further highlighting the fact that meetings need to be more focused and goal-orientated.